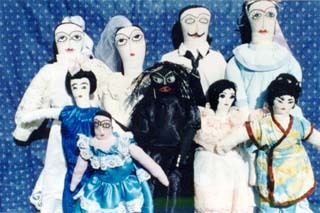 These dolls are each individually hand made by Senora Diaz, a Mexican woman who lives in the remote village of Chacala. Using her daughters' outgrown clothing, she carefully sews and decorates her dolls with jewelry and hair ornaments. Every Senora doll has her Senor, and a matched pair would make a perfect wedding gift or special present for any child. Size: 10" to 30" tall. - Price: $35 - $125 each.